The first preaching took place in 1775 in lower Gloucester County by a man named Iverson Lewis. He established two churches during his time, one in Mathews County (orginally known as Kingston) and the other in lower Gloucester County (known then as Abingdon) and is now called Union Baptist Church. In 1868, a new church out of Union was established and structure built for the many black members at that time; First Morning Star Baptist Church. 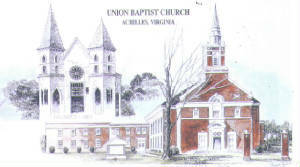 Since the beginning, Union Baptist Church has called 32 Pastors and from our church three other churches were started – Providence Baptist Church, Gloucester Point Baptist Church and White Marsh Baptist Church. In 1948, it was obvious to the members of Union that we needed a new building. The membership was 900. Plans were set in place. In 1949 the new parsonage was built. On Sunday, October 14, 1956 a ground breaking ceremony was held for our church building. The new sancturay was completed on April 29, 1958. A new wing housing Sunday School rooms, a conference room, Church offices and a Media Library was added in 1986. Union Baptist is a full service church. We offer a ministry especially tailored for every age group. We average 300 – 350 in our Sunday Morning Service and 250 in Sunday School. We have a rich history in Gloucester County serving our Lord and ministering to the lost.